It was marvellous to open the New Zealand Herald this morning and find, instead of the usual photographs of distressed celebrities and mangled cars, an image of Visesio Siasau standing staunchly in front of some of the painted ngatu panels that have won him the big prize at this year's Wallace Art Awards. Siasau's win gives him a trophy, six months in New York City, and name recognition across the New Zealand art world. The Herald describes Siasau's entry for the Wallace awards as a 'huge tapa bark cloth depicting traditional figures of divinity within a Christian context', but these words hardly capture the ambition and strangeness of the artist's work. Any reader of the Herald who examines the photograph of Siasau's ngatu carefully will notice that the image of Christ on one of his panels is decorated, or defaced, by a dollar sign. In previous works, including a series of sculptures made from glass and a type of plastic, Siasau has crucified the Tongan god Tangaloa and placed Catholic icons like Mary and Joseph on a sort of chessboard where members of the pantheon of old Polynesian gods lurk. For all their originality, the images that Visesio Siasau makes today can be understood in relation to his Tongan childhood. Siasau grew up in Haveluloto, a poor suburb on the edge of Nuku'alofa where roads of dusty coral run down to a polluted lagoon. He is a cousin of Tevita Latu, the dissident and painter who has created an avant-garde movement called the Seleka Club in a lagoonside shack. Like most of the citizens of Haveluloto, Siasau could track his ancestry to Ha'apai, the now-remote archipelago that was once, for a century or so, the political and cultural capital of Tonga. The islands of Ha'apai are small and low, and their people have always been known as boatbuilders and woodworkers and navigators. Many of Siasau's older male relations built and carved. To grow up in Haveluloto in the 1980 and '90s was to inhabit two worlds. Around the kava bowl young men like Visesio heard stories about epic sea journeys and ancient battles. On the streets of Nuku'alofa, though, they encountered convenience stores with barred windows, gangs filled with high school dropouts and deportees, and homeless beggars slumped outside salubrious churches. The riot which destroyed much of downtown Nuku'alofa in 2006 only dramatised a crisis that Siasau had observed many years earlier. Siasau's art can be seen as an attempt to reconnect the streets of Nuku'alofa with the Tonga of his ancestors. Using not only oral tradition but the work of palangi scholars like the late great Roger Neich, he has tried to recover and redeploy the culture of pre-Christian, pre-capitalist Tonga. In 2013, when I lived in the Friendly Islands, I drove with Siasau out of Nuku'alofa and into the Tongan countryside, as he searched for the locations of the godhouses where shaman-priests of the old religion would down bowls of green kava, quiver with piety, and channel the voices of gods like Tangaloa and Hikule'o. When Christianity came to Tonga at the point of a gun, the godhouses were burned and their carvings were either smashed or handed to missionaries as captives. Pigs were run through the sacred grounds around the razed houses. Using local rumours, old kava bowl stories, and the details that scholars like Neich had prised from missionary letters and diaries, Siasau was trying to map the sacred landscape of old Tonga. As our car wallowed in the potholes of roads built over ancient walking tracks, he gestured at the locations of the vanished godhouses, and pointed out traces of the past that had survived the depredations of Christian fundamentalism and commercial agriculture: burial mounds, sacred boulders, and a deep, thistle-filled gully that once been a saltwater canal where ships from 'Uvea and Fiji waited to be emptied of their koloa. It would be easy, but also wrong, to dismiss Visesio Siasau as a sentimental antiquarian, a sort of Tongan version of Frank Leavis, the English literary critic who deplored modern life and longed for the 'organic community' that supposedly existed in medieval Europe. But a look at Siasau's art shows that he lacks Leavis' morbid nostalgia, as well as the typically palangi habit of dichotomising past and present. Rather than lamenting an idealised past, he wants to suggest how ancient Tongan culture can play a part in the country's twenty-first century life. His syncretic gods are supposed to shock Tongans and palangi alike into pondering how apparently opposed religious and philosophical systems might be reconciled and combined. The series of ngatu paintings that have won Visesio Siasau the Wallace Award were created in Havleluloto last year, after the artist had conducted a succession of interviews with the inhabitants of the suburb. He listened to his relatives and neighbours talk about their beliefs, preoccupations, and problems, then searched for images capable of conveying what he had heard. 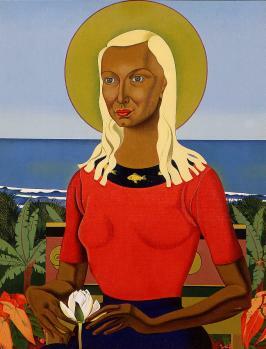 The painting that adorns Christ with a dollar sign is Siasau's sardonic but not unsympathetic response to stories about the excesses of some Tongan churches. The sources of Visesio Siasau's images might seem exotic, and even esoteric, to many New Zealanders, but I would argue that his art has parallels with the work of some of our greatest twentieth century painters. Siasau's mixture of dissatisfaction with twenty-first century capitalist civilisation and fascination with ancient Polynesian religion might remind us of Tony Fomison and Emily Karaka, those great and greatly disturbing rebels against both the commercialism and the secularism of late twentieth century New Zealand. Siasau's urgent and unashamed asking of religious questions reminds me of the stark graffiti Colin McCahon left on his last canvases. And the syncretic deities that Siasau exhibits surely recall the intricate and enchanted goddess paintings of Rita Angus. Like McCahon and Fomison and Angus in their day, Visesio Siasau has sometimes encountered prejudice and misunderstanding. Some conservative Tongans have condemned his godmaking as impious and impudent; others have criticised him for painting on ngatu, a medium traditionally associated with women. 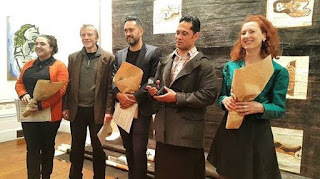 I hope that the Wallace Award will encourage these Tongan critics to revisit their judgments, and also win Siasau a much wider audience in New Zealand. Footnote: this is only a quick and off the cuff response to Sio's victory, and I apologise in advance for its inevitable oversights and simplifications. I wrote in more detail about the artist's god-hunting back at the beginning of last year. It's great he won that prize. Looks like a challenging work he has undertaken. I should go to the Pah Homestead. I went there on my birthday in 2013 with my daughter etc I took a lot of photographs of art there, but I am not always sure which artist is which. 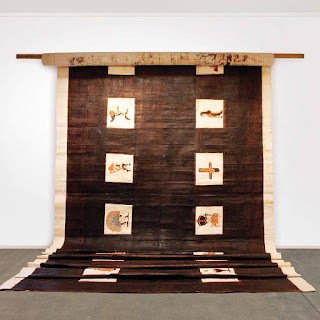 The tapa cloth with drawings etc worked well for John Pule. Interesting links to Fomison and Rita Angus. When the US Poet Creeley was here giving lectures (I think it was 1995) he kept going back to a Fomison exhibition that disturbed and moved him. Fomison I met once or twice at some gallery openings. A rather quiet, unassuming fellow (Wystan Curnow I think expressed once to me that he wasn't much interested in his work for 'complex reasons'...but I don't think that we can dismiss the complex that is art. It is not some theorist idea of what art is - not that theory is bad - but it is a large project. It wasn't the 'darkness' that disturbed Creeley (one thinks of his early poems, his Auckland poems I don't think were much good, and by the way his diaristic dialogue in several volumes (I once picked up most of them from a shop in Howick that fortunately knew nothing of Creeley or Olson - recall though that Olson and say Saul Bellow did degrees in Anthropology): and ironically there is a picture of Wystan and his mother done by Rita Angus. Her god-women are haunting indeed. And Curnow also extols in catalogs etc the work, even the 'religious' works of McCahon. McCahon has to be one of our great artists like such as Hotere. So interesting connections there. People are ambiguous about Paul Gauguin but I think he saw something of the mystery and dark beauty of pre-Christian religion or mythology etc and it entered his works. He was also at odds with the Christian and other authorities. And it I wonder if, given time, Bloom would concede that, wonderful as those Western artists are, there is no centre as such. 'Things fall apart, the centre cannot hold...' Or "the centre" is everywhere. That might be what the art in the US can convey - McCahon made one visit that influenced his works, although he went his own way, and his use of religion or philosophy or 'spirituality' is interesting (but he seems to be in now way contesting the status quo, so perhaps just working with the mystery. I meant that it 'wasn't the darkness that disturbed Curnow, but it did Creeley of 'the darkness surrounds us', but he also kept worrying (aloud) about Ed Dorn's 'Abhorrences': I think also that that time 1994 was the resultant of the Rogernomic and eventually ACT and the political climate at the time that affected at the social level. Creeley seemed aware of a general malaise. But of course the Fomison exhibition was not a 'political' one but was on at the time Creeley was here. Certainly Fomison's vision is or was not a particularly popular one. It was dark in many ways, but not altogether. He also 'bridged the divide' somewhat. 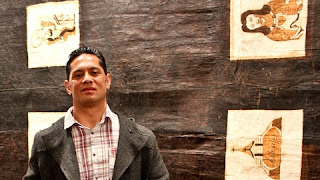 Yes, it's a big win for Sio and for Tongan visual art, Richard. I'm very pleased for him, because he really hasn't had the easiest road as an artist. He's had to live in a frugal and improvisational way, moving from house to house and making art wherever he can, whilst at the time trying to maintain a family life. He's an idealist who has been disinclined to compromise his artistic vision to move his career forward. But talent and vision and hard work sometimes win out over birth and networking and cynicism! I don't mean to knock artists who were born in the West, with silver spoons in their mouths. I'm no horny-handed son of the working class! But if ever an artist deserved an award, it is Sio. Have you read Martin Edmond's Dark Night, about McCahon's last visit to Sydney? Sad and interesting. Sio has something of the high modernist seriousness of McCahon and Angus - the sort of intensity and intolerance for ephemera that has been easy to mock in the era postmodernism, but which may now once again be fascinating audiences. Or so I'm hoping! Are you coming to the Titus launch next week? Good to see Olivia publishing again. Ho! My comment about silver spoons...! All arises! But must it converge and the violent bear it away?! [Couldn't resist some mish mash Taylorization...] Re silver spooners, or those who at least acquired such spoons in mouths...I was reading about Stevens via Harold Bloom, and he is an interesting example, almost of a 'pure artist', which I think I saw Sio allude to, he was able to be relatively angst ridden: but they are unfair who attack (such as) Woolf (for being a snob) or Merrill (for being in a family that was incredibly rich, but the 'mother' he most loved was his German nanny, not his very rich parents so much): silver spoons or not all artists struggle in their own ways, (as the poet-artist is always an outsider, regardless of how 'successful'). I agree though of most said above, and it is good to see him win from hard work, I didn't know he was struggling in that sense. Good to see his career get a kick start or a boost. I recall when that book came out by Edmond. I have only read some of one of his works and his book about Clairmont, as well as a small book he wrote. Interesting writer for sure. McCahon I didn't always like (I always liked his I AM though...took longer to get into his numbers etc) but I read about three books about his art, I think 2 were by Peter Simpson: very good. These increased my interest. Lloyd Geering, the intransigent religious rebel (even radical) from the fold wrote about McCahon. McCahon is one of the 20th Century greats for sure. No one in the world is quite like him, there is a rawness he has, a strength, darkness, depth: as well as knowledge. Yes, I must come to the launch, I like Olivia and her work, and Christie: but I don't know Painter's work (there's another Holly Painter in the US I think it is). So it will be interesting. 5 pm Thursday week, at the Alleluyah. Halleluyah!